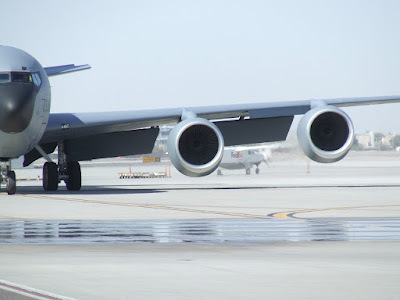 Too big to fit in the frame - a 161st Air Refueling Wing KC-135. Aviation photographers love any chance to get close to the action. And being on the ground level next to one of the runways at a major airport? Excellent. And if the vantage point is at a military installation? Jackpot! A few years ago, a work event offered me that chance. The only downside is that I hadn’t yet advanced to using a digital SLR. 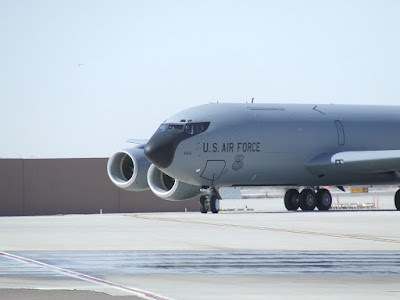 I took these aviation photos at Phoenix Sky Harbor International Airport, right at the home of the 161st Air Refueling Wing of the Arizona National Guard. This excursion yielded some great perspectives of the 161st Wing’s KC-135 aircraft. 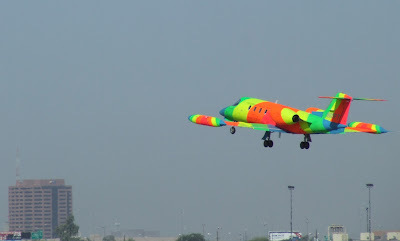 I also grabbed some shots of a 727 and a brightly painted corporate jet. I also got some of the usual 737 sorts of aircraft that are the mainstay of Sky Harbor air traffic – not exactly the sort of thing that excites aviation geeks, I know. But the runway-level perspective turns them into a little something different. My photo friend N. Scott Trimble was also there. I’d love to see what someone with his skills took home from the same place. Of course, with the sheer volume of images a working photographer generates, I expect most of these are long-gone from his hard drives. Then again, he is an aviation geek who might’ve squirreled a few away. 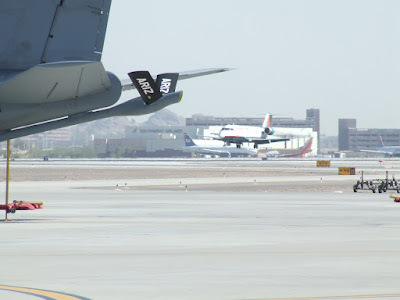 Now that I use a Pentax DSLR, I’d go crazy for another chance at some ground-level aviation photography at Sky Harbor. The 727 - a blast from the bast. A cool boulder with malachite - and some little airplane in the background. The International Jet Dream Chaser takes off. The tailboom in its upright and locked position.